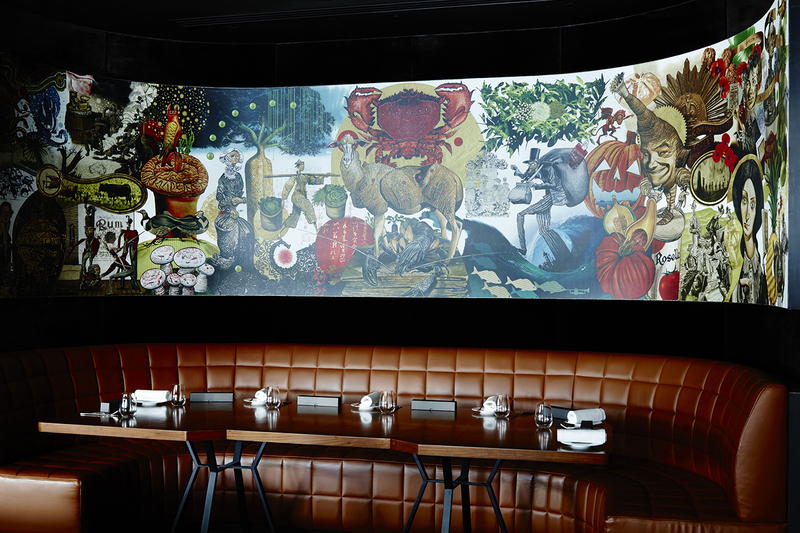 Those of us familiar with the original Dinner by Heston will recognise a few motifs in this latest incarnation - the Hieronymus Bosch-esque wallpaper, the kitchen in all its frenetic energy on display like a glass-walled amphitheatre, the slowly spinning pineapples being gently roasted as they await their destiny to be turned into Tipsy Cake. 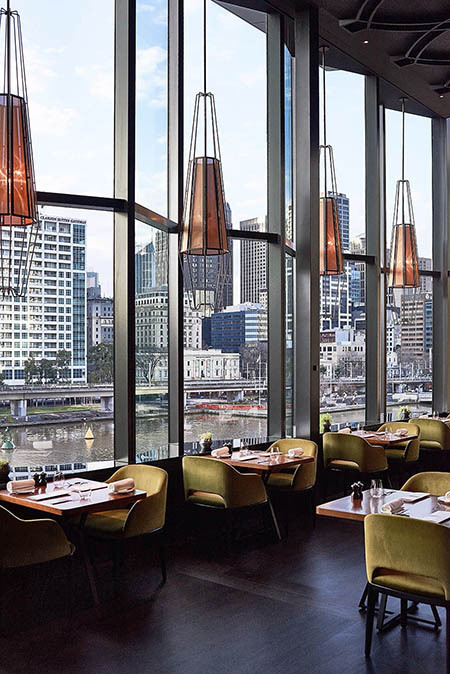 However, where the Mandarin Oriental restaurant enjoys a verdant view of the greenery of Hyde Park, the Melbourne restaurant in Crown Towers instead offers the twinkling lights of Melbourne CBD just beyond the Yarra River. It is this view that I have front seats to - beside the window and right above the fiery towers along the Southbank that burst in ferocious flames on the hour, every hour. 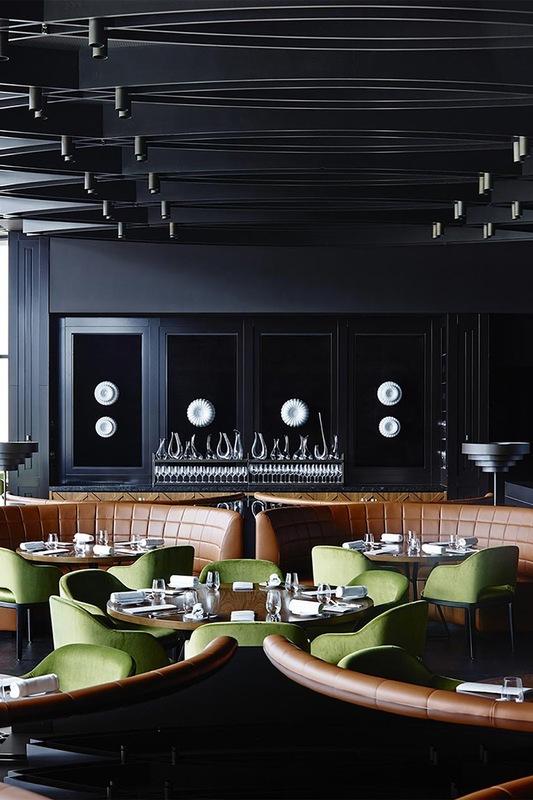 But of course I would enjoy such a coveted spot in the handsome dining room - I had booked my reservation for the practically-geriatric time of 5:30pm, knowing full well that a Heston Blumenthal meal was not one to be rushed and needed several hours to enjoy. Tip: The early bird catches the worm, or rather the view. 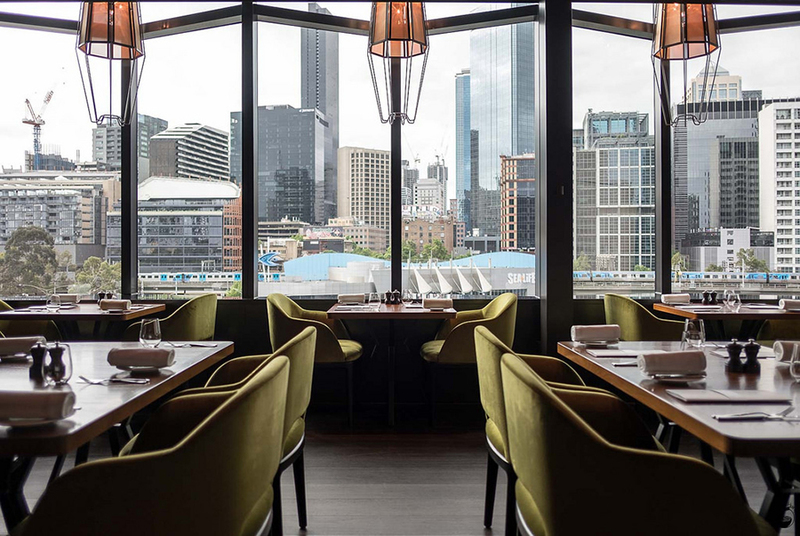 Make your reservation for an hour before sunset; peruse the menu at leisure while sipping champagne as the sun slowly sets, then eat your way through the ever-changing colours of the city as the day gives way to night. I wanted to sample as many dishes as my newly-shrunken stomach would allow, so I utilised my favourite tactic of ordering a few starters rather than a starter and a main course. I whet my palate with the iconic Meat Fruit (above). For the uninitiated, that's what looks like a very realistic orange (down to the sheen of the skin) but is in fact a gorgeously rich chicken liver pate designed to evoke serious cognitive dissonance, sensory confusion, and possibly an existential crisis. 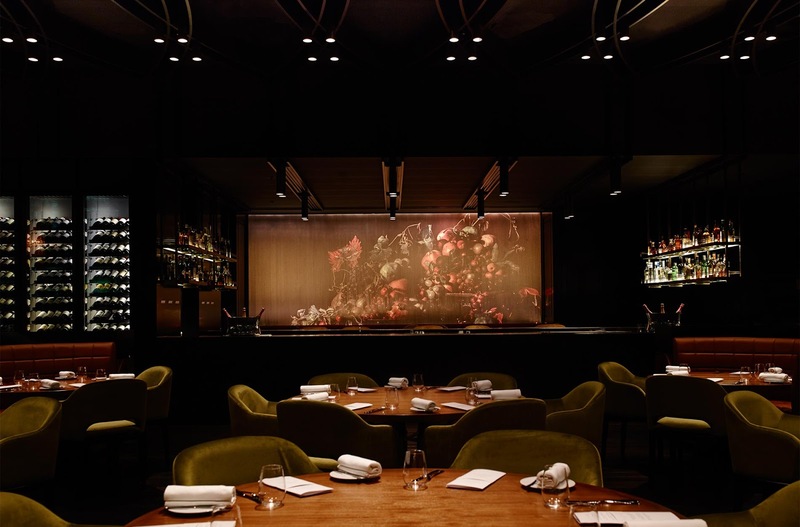 Meat Fruit, I feel, perfectly sums up the madness and magic of Heston Blumenthal and delivers it in a neat, accessible package for those who can't or won't get themselves down to Fat Duck. Meat Fruit may be a classic but my following dish was definitely new to the scene: Rice & Flesh (below), a 14th century-based dish of saffron risotto with curry-spiced kangaroo. I have long since banished kangaroos from my conscience as cute and cuddly eversince age 8, when one stole and ate my Kangol hat (CANNIBALISM) and so had no problem at all eating the tail of Australia's mascot animal. But I wish I hadn't. I think it was knowing what it was that made me uneasy and hence tainted the experience for me. I swear that every chunk of kangaroo tail I bit into tasted like what wet dog smells like - yeasty and pungent. It didn't help that the leafy garnish yielded a deep red liquid when bitten into, adding the illusion of blood seeping from the flesh. That said, the saffron risotto on its own was absolutely gorgeous; creamy and nutty. It's a dish worth trying for the adventurous and less squeamish. Far more enjoyable was Frumenty, another recipe from 1390. Grilled octopus tentacles bathed in an umami broth that recalled so many flavours - the saltiness of the sea, the herbal soups my grandmother used to make, among others. Standing undisturbed in this smoky sea broth were dots of chervil and leek emulsion, bringing a sweetness to this plate of complex, delicate flavour. Samphire, spelt, and red moss added yet more texture and colour to this incredibly technical and flawlessly executed dish. I honestly believe that even those a jaded by fine dining *cough* would gush over it! By then, I had already eaten my way through 3 dishes - all of them starters - and the sky outside had changed from the golden hour, to sunset, to pitch darkness. 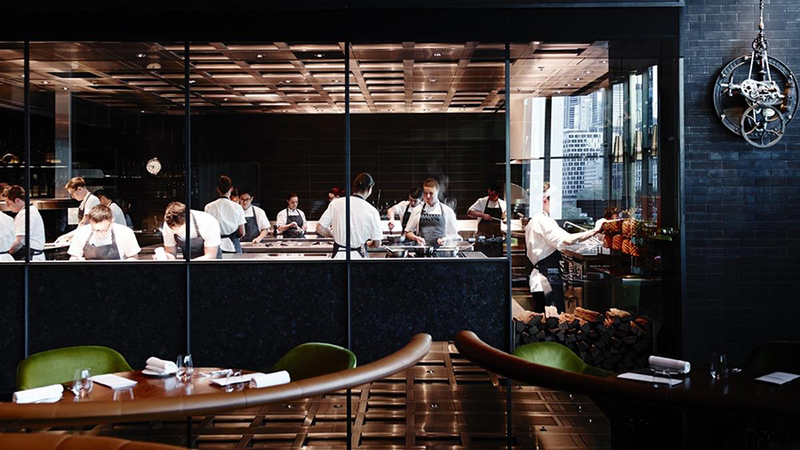 It goes without saying that when it comes to fine dining, it's all about slow and steady, the journey rather than the destination. 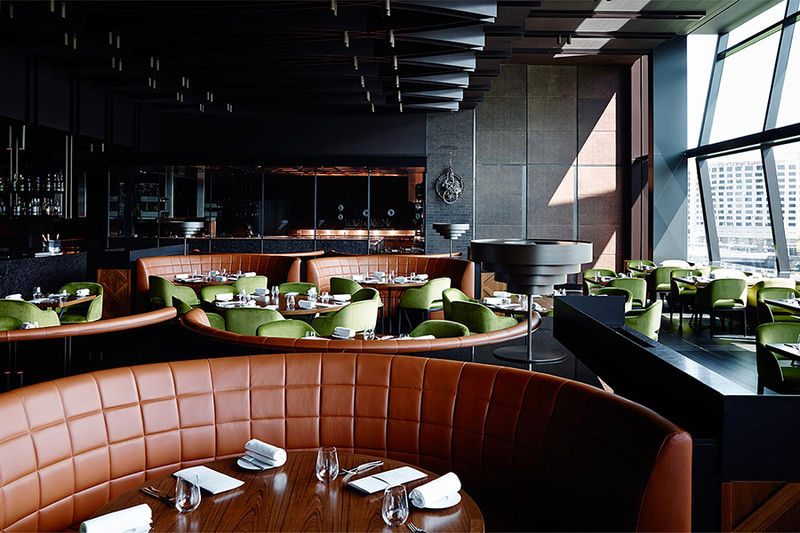 And what a journey - as to be expected, the knowledgable staff will explain in great detail and with pride the history, the process, and idiosyncrasies of each dish. The ice-cream trolley at Dinner by Heston is another classic: hand spun ice-cream made with liquid nitrogen before your very eyes, topped with a choice of popping candy in several flavours. It goes without saying that a cone made its way into my hands. Of course I had to also order an 'Aussie special': the Ice Cream with Vegemite (c.1920). Now, after my unpleasant surprise with the kangaroo you'd forgive me for being wary of another crazy Down Under flavour. There was nothing to fear: the Vegemite (which in my opinion is the worst thing anyone can put on a sandwich) merely brought out the flavours of the ice-cream and its toppings - toasted barley cream, yeast caramel, macadamia, puffed spelt & sourdough crumble - like sea salt flakes in a chocolate milkshake, like salted caramel but with a hint of yeast. I'd go as far to say that this is the only acceptable use for Vegemite! I mentioned earlier that these metal structures outside Crown Towers on the Southbank belch fire every hour, and that these flaming displays were merely metres from my seat. This is how I came to realise, 3 fire shows later, that I had spent over 3 hours working my way through 5 courses (5.5 if you count the complimentary chocolate and biscuits) a lemonade, and a glass of champagne. But what is 3 hours when you think of the 24 hour flight from London to Melbourne? This and other food coma-induced thoughts washed over me in a warm wave - or maybe that was just the comforting lull of a full belly - hardly even jolted into reality by the bill.